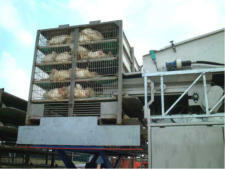 With the global success of the Easyload Live Bird Handling System, Anglia Autoflow has developed a range of harvesting equipment in response to customer needs in markets where recruiting and retaining the right kind of catching operators is difficult. 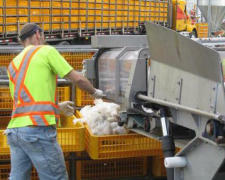 Universal Harvesting System (UHS) For loading birds into drawer type containers, 'dump' containers and plastic crates. 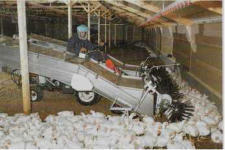 Automatic Harvesting System (AHS) For automatically loading birds into drawer type containers and 'dump' containers. 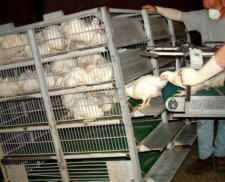 Both of these systems are based on the principle of separating the catching and loading operations. 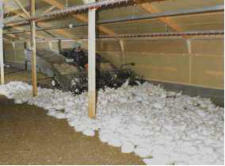 Our catching machine(s)work in sheds with or without posts. 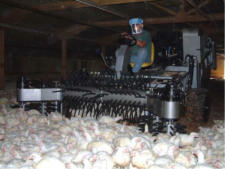 Collected birds are deposited onto a receiving hopper and then transferred either to a loader conveyor controlled by an operator, or to an automatic loader.